Over $35,000 Donated and Over 70 Winning Athletes! School’s Athletic department. Congratulations to each of these winning athletes! Stephanie Garcia has started the 2017 indoor season on a high note for the Lady Saints. Recently she won both the 55 and 200m dashes at the North Central Cardinal Classic featuring 18 of the top track programs in the state. She set new personal indoor records for both the 55 and 200, and is now #3 and #5 all time respectively in those events in Saints history. Congratulations Stephanie! Erik is a Senior with a record of 26-10. He recently won the Sycamore Regional in the 195 weight cass Erik works hard and leads by example. Erik is respected by his teammates as they voted him as their Team Captain. Congratulations, Erik! Sam is a senior captain of the Girls Basketball team. Sam is the team leader in assists and was recently named to the Wheaton North Holiday Classic All-Tournament Team where she lead the Saints to the Tournaments Championship Game. Congratulations, Sam! Co-Captain, Anna Davern, is off to an outstanding start in her Junior season. In addition to being named to the All-Tournament team at the Hoffman Estates Thanksgiving Tournament, she currently leads the Norht Stars in points per game (16.6), Rebounds per game (8.3) and Assists per game (3.3). Congratulations, Anna! Dionte Pierre runns by Woodstock for 123 rushing yards and two touchdowns. The first, a 53 yd burst up th emiddle to the the game early in the first quarter. The second, on a 4th and goal plunge from the 1 which turned out to be the winning touchdown for the Rockets. The performance helped the Rockets win for the first time since 10/23/15. Congratulations, Dionte! Joe has been essential to our overall team success over the past four seasons. In a month filled with numerous memorable moments, Joe’s 1 under 70 at the Geneva Mill Creek Varsity invitation tournament best showcased the caliber of his talents. Congratulations, Joe! Rasmussen contributed two goals and an assist to a 3-0 win against Geneva on April 9, helping the host Saints to a tournament title in their own Augsburg-Drach Invite. The victory maintained East’s shutout streak as the team improved to 9-0. Congratulations, Claire! 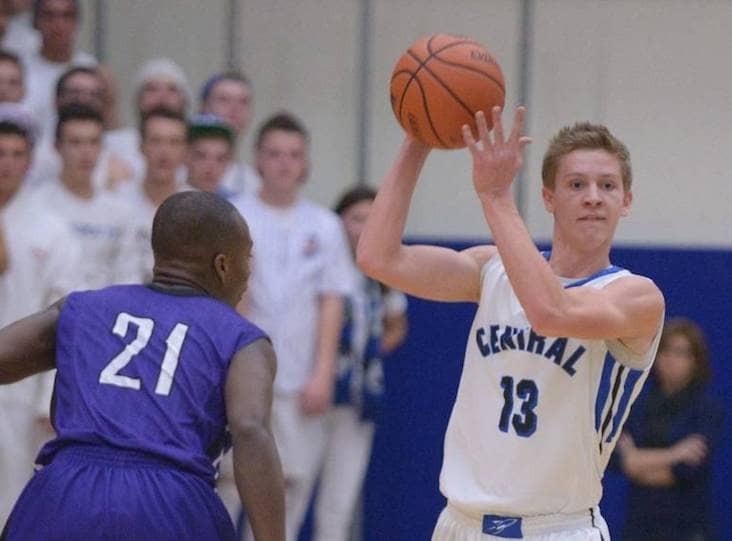 Luke McCurdy is a senior captain on the Burlington Central Boys Basketball team. This season Luke averages 5.9 p.p.g., 4.5 r.p.g., along with 2.6 a.p.g. McCurdy has been an instrumental part of leading Burlington Central to a big Northern Conference title and an overall record of 25-3. McCurdy’s leadership, character, and being our ‘coach on the court” has been a huge reason for the Rockets success this season. Congratulations, Luke! Austin Macias is a Sophomore with a record of 26-1 and he currenlty holds the school record for wins in a single season. This spring, he was a Greco State Champion. Austin took 2nd Place at Freestyle State. This season Austin has reached the finals in four tournaments, winning three of them. He currently leads the team in Take Downs and Pins. Austin works hard on and off the mat and is considered a team leader. Congratulations Austin! Kayla Ross is a 4-year varsity starter who is about to score her 1000th point for Burlington Central. She is apart of two All-Tournament teams this season: the Burlington Central Thanksgiving Tournament and the Dundee-Crown Christmas Tournament. She has been team captain for the past 2 seasons. Congratulations Kayla! Ryan Fitzgerald helped the Rockets capture the Leland G. Strombom Thanksgiving tournament at Sycamore. Central went 4-0 to win the Championship beating Sandwich, Dundee Crown, Sycamore, and Rockford Jefferson. Ryan Fitzgerald averaged 15 p.p.g and 8 r.p.g. In the championship game Ryan had a double double which was his second of the tournament. Ryan Fitzgerald also earned all tournament team honors. Congratulations Ryan! Cam is a senior football player and the Saints leading rusher this season. He has rushed for 350 yards averaging 70 yards per game with a long of 50 yards. He also has 3 touchdowns on the year! Isabel Herb is a member of the Saints Swim Team. She works hard everyday, every moment and every second of practice. Isabel will be swimming and studying next year at Miami University of Ohio! Rose has been the Lady Saint #1 golfer this season with an average score of 41. Rose and her teammates combined to win the Hersey Girls Golf invite earlier this season. 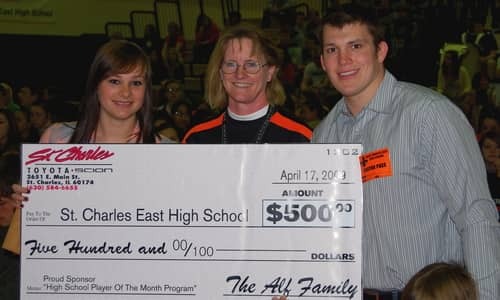 St Charles East High School – Athlete of the Month. outstanding achievements in Softball. Congratulations Alex! outstanding achievements in Basketball. Congratulations Andrew! outstanding achievements in cheerleading. Congratulations Marissa! outstanding achievements in basketball. Congratulations Julian! outstanding achievements in basketball. Congratulations Katie! outstanding achievements in Cross Country. Congratulations Mark! outstanding achievements in Swimming. Congratulations Jordan! outstanding achievements in Volleyball. Congratulations Daley! basketball team, a member of the swim team and a 3-event state qualifier (4×100 relay, 100M run, 200M run) on the track team. 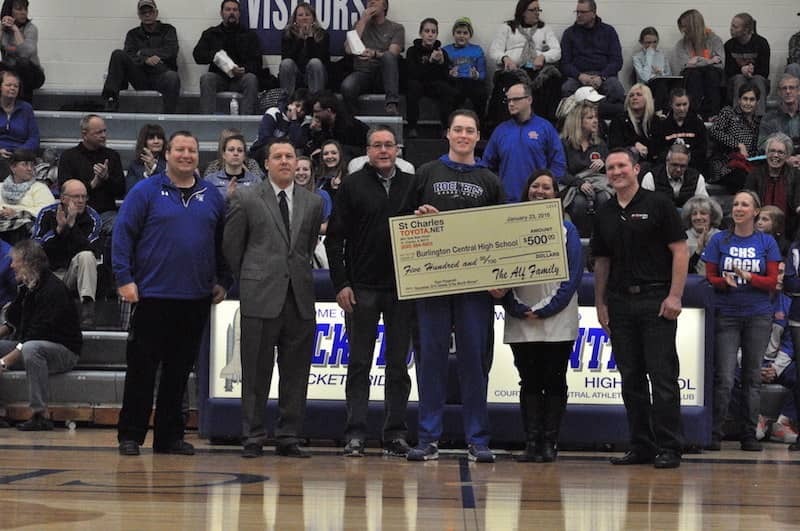 St Charles Toyota Scion is proud to present Athlete of the Month to Kaneland High School’s Tyler Carlson for his outstanding achievements in basketball. Congratulations Tyler! 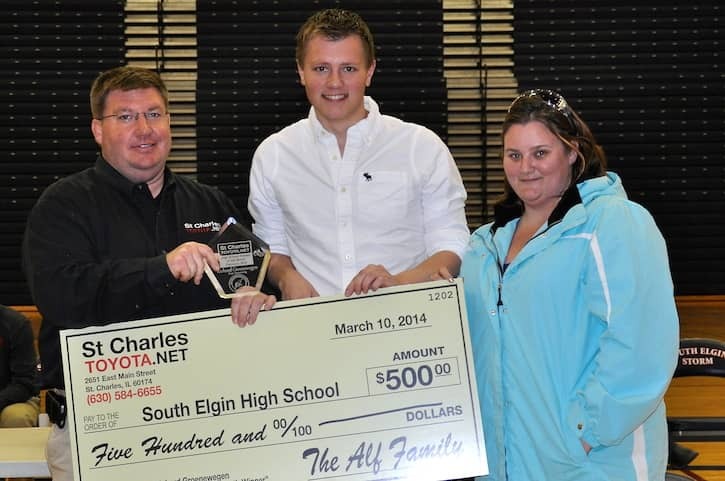 St Charles Toyota Scion is proud to present Athlete of the Month to South Elgin High School’s Richard Groenwegen for his outstanding achievements in swimming. Congratulations Richard! 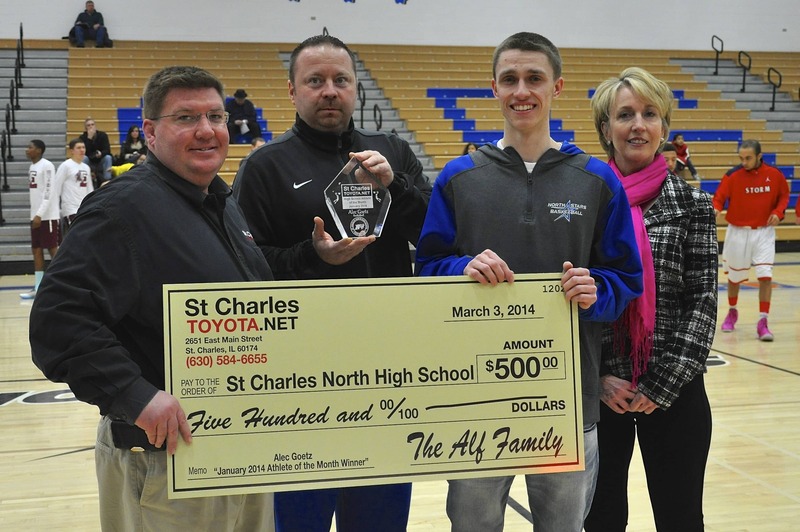 St Charles Toyota Scion is proud to present Athlete of the Month to St Charles North High School’s Alec Goetz for his outstanding achievements in basketball. Congratulations Alec! 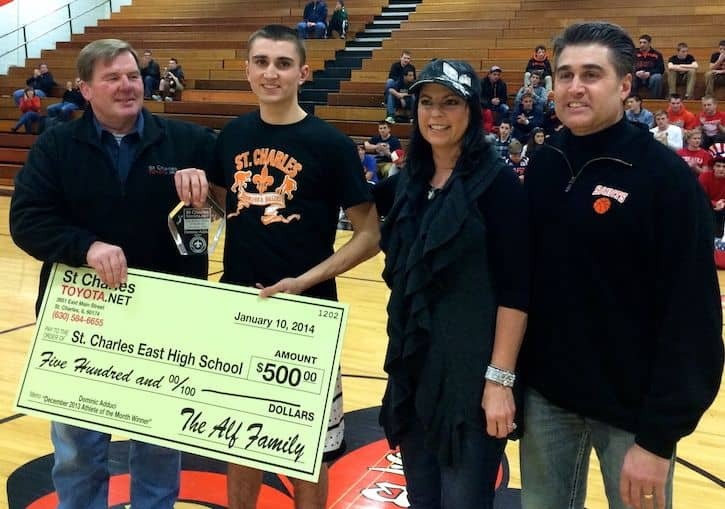 St Charles Toyota Scion is proud to present Athlete of the Month to St Charles East High School’s Dominic Adduce for his outstanding achievements in basketball. Congratulations Dominic! 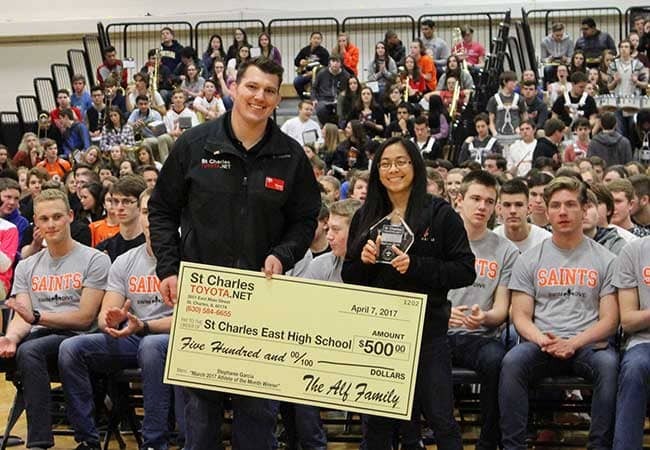 St Charles Toyota Scion is proud to present Athlete of the Month to St Charles East High School’s Shea Hoyt for her outstanding achievements in swimming. Congratulations Shea! 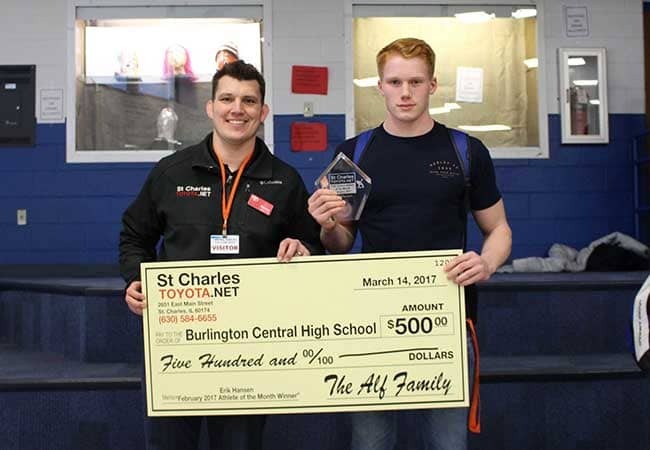 St Charles Toyota Scion is proud to present Athlete of the Month to St Charles North High School’s Evan Kurtz for his outstanding achievements in football. Congratulations Evan! 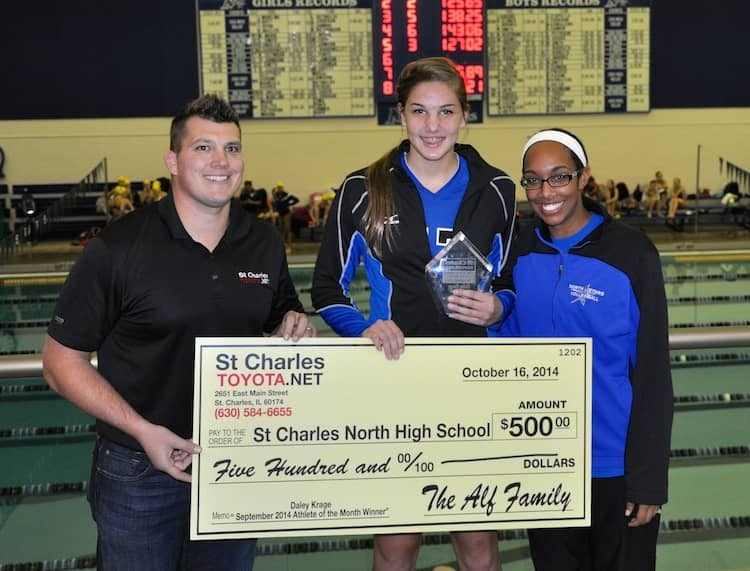 St Charles Toyota Scion is proud to present Athlete of the Month to St Charles North High School’s Taylor Krage for her outstanding achievements in volleyball. Congratulations Taylor! 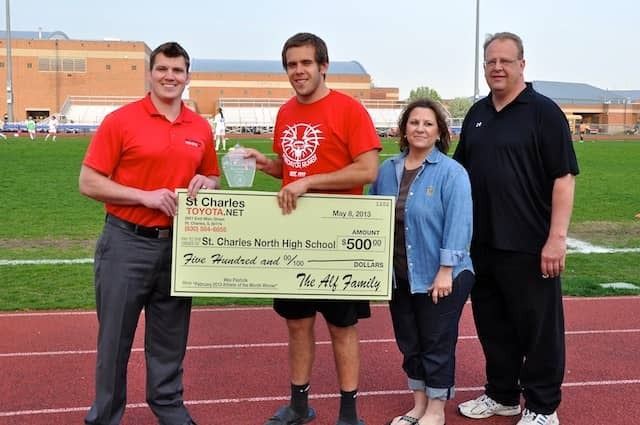 St Charles Toyota Scion is proud to present Athlete of the Month to St Charles North High School’s Grant Loess for his outstanding acheivements in track. Congratulations Grant! 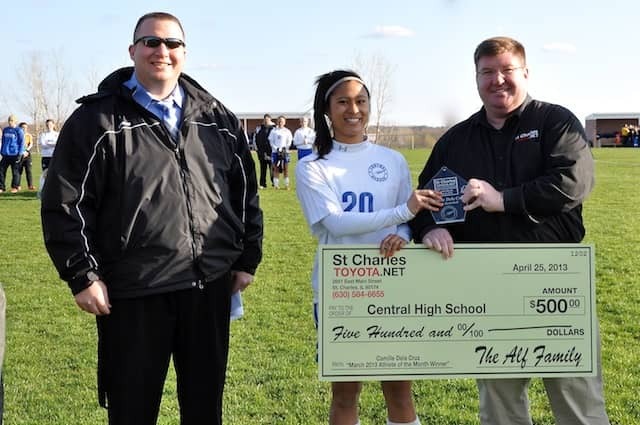 St Charles Toyota Scion is proud to present Athlete of the Month to Central High School’s Camille Dela Cruz for her outstanding acheivements in basketball. Congratulations Camille! 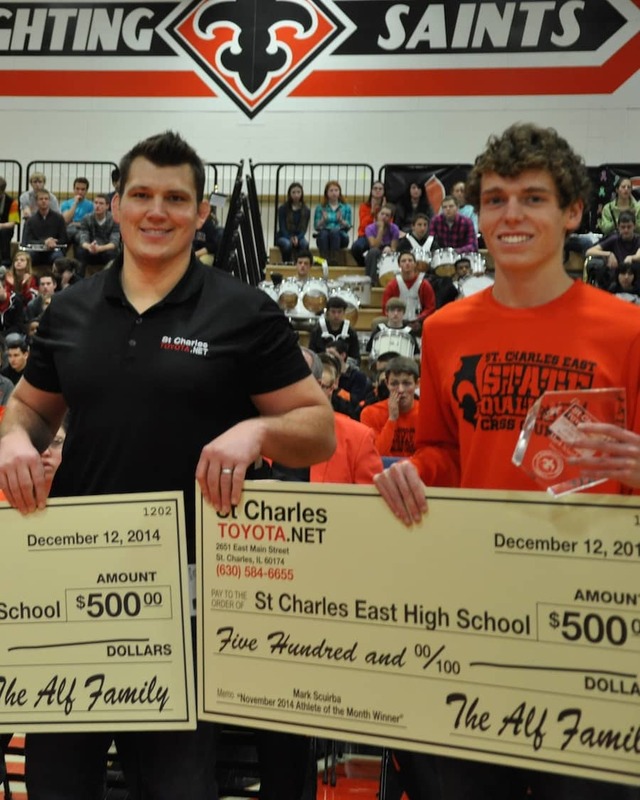 St Charles Toyota Scion is proud to present Athlete of the Month to St Charles North High School’s Wes Pasholk for his outstanding acheivements in wrestling. Congratulations Wes! 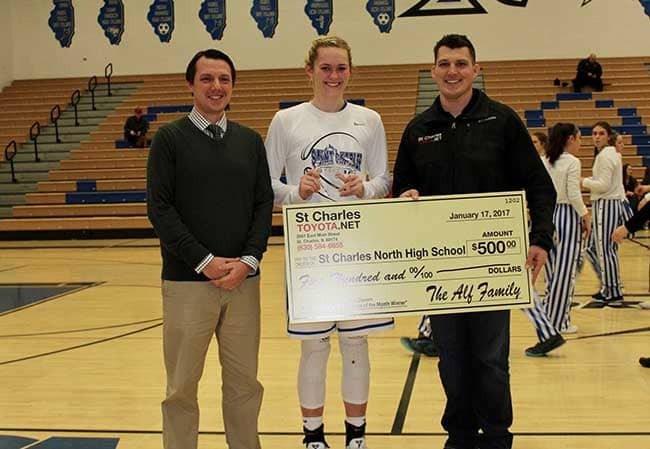 St Charles Toyota Scion is proud to present Athlete of the Month to Batavia High School’s Liza Fruendt for her outstanding achievements in basketball. Congratulations Liza! 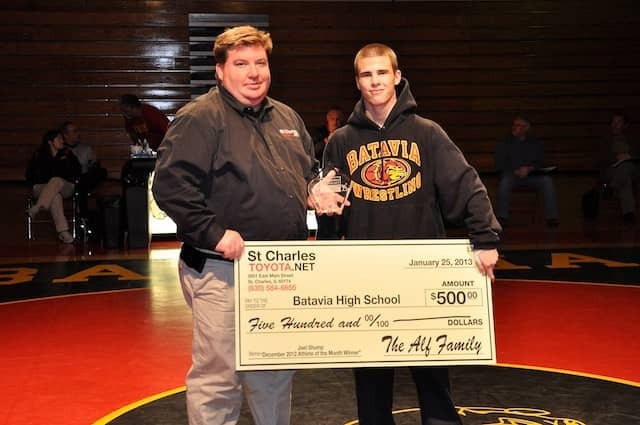 St Charles Toyota Scion is proud to present Athlete of the Month to Batavia High School’s Joel Shump for his outstanding achievements in wrestling. Congratulations Joel! 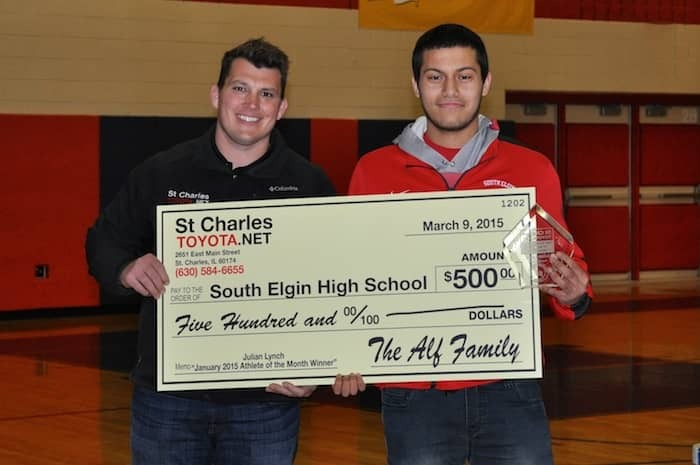 St Charles Toyota Scion is proud to present Athlete of the Month to Geneva High School’s Mike Bianchina for his outstanding achievements in Cross Country. Congratulations Mike! 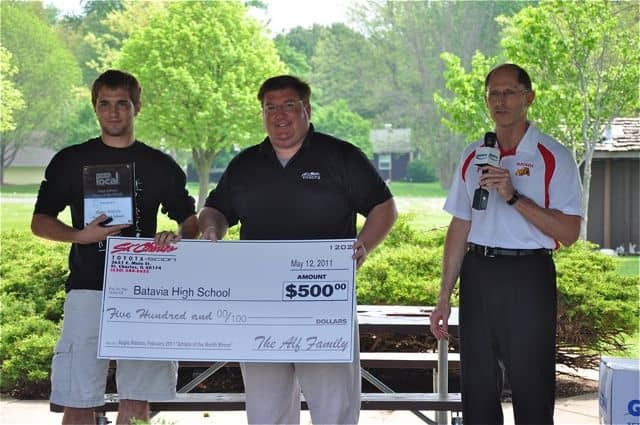 St Charles Toyota Scion is prous to present Athlete of the Month to Batavia High School’s Mickey Watson for his outstanding achievements in football. Congratulations Mickey! 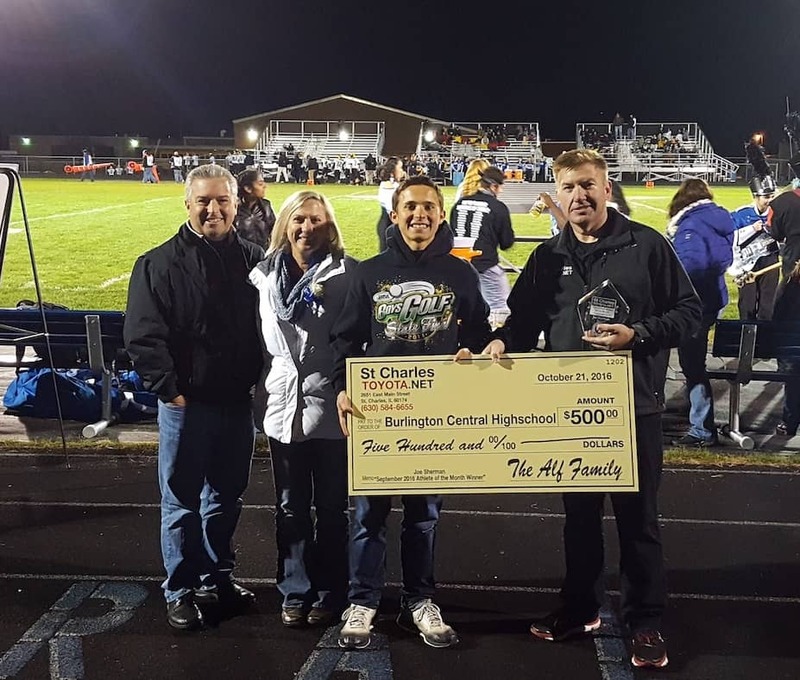 St Charles Toyota Scion is proud to present Athlete of the Month to Batavia High School’s Anthony Scaccia for his outstanding achievements in football. Congratulations Anthony! 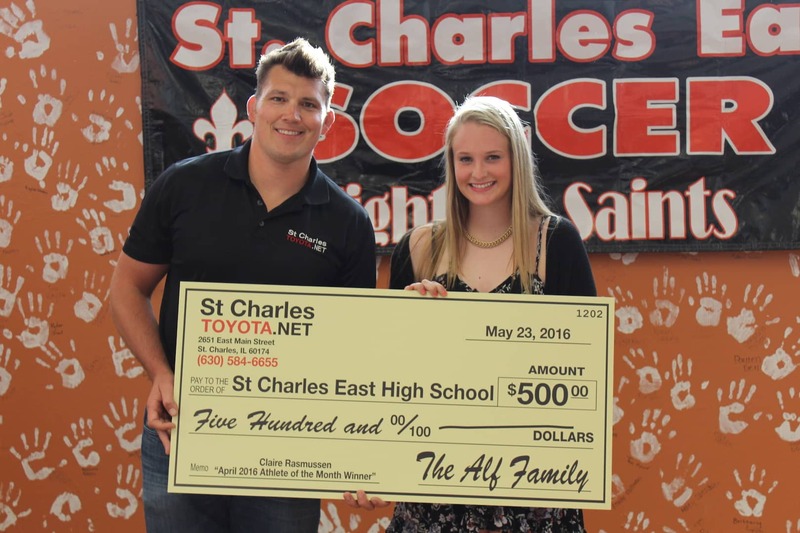 St Charles Toyota Scion is proud to present Athlete of the Month to Geneva High School’s Catherine Allon for her outstanding acheivements in girls soccer. Congratulations Catherine! 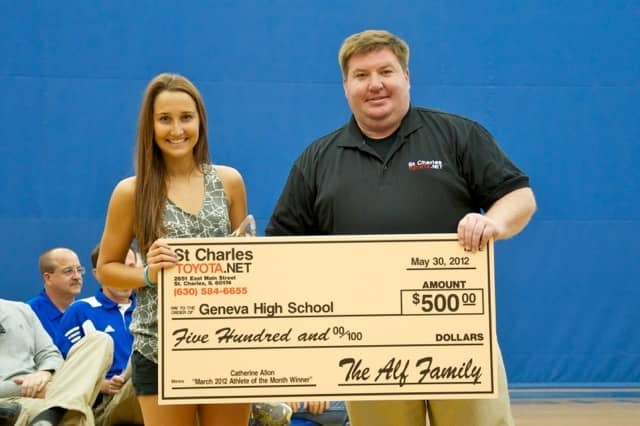 St Charles Toyota Scion is proud to present Athlete of the Month to Geneva High School’s Ashley Puff for her outstanding achievements in gymnastics. Congratulations Ashley! 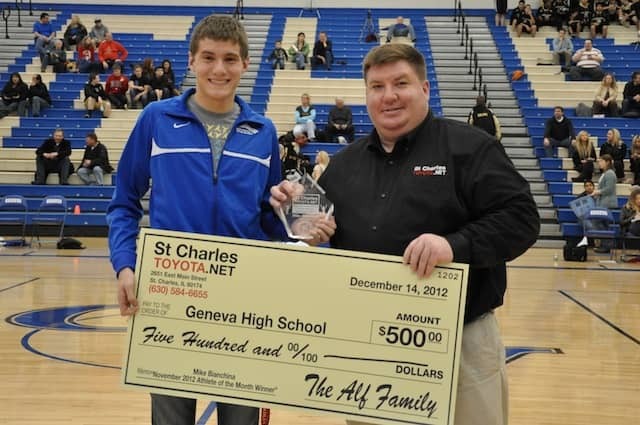 St Charles Toyota Scion is proud to present Athlete of the Month to Geneva High School’s Brendan Leahy for his outstandin achievements in boys basketball. Congratulations Brendan! 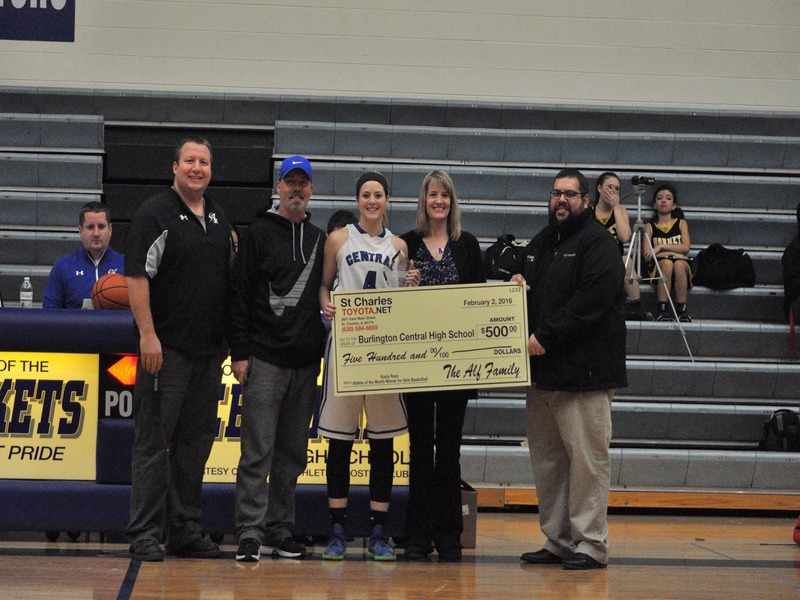 St Charles Toyota Scion is proud to present Athlete of the Month to Geneva High School’s Sami Pawlak for her outstanding achievements in girls basketball. Congratulations Sami! 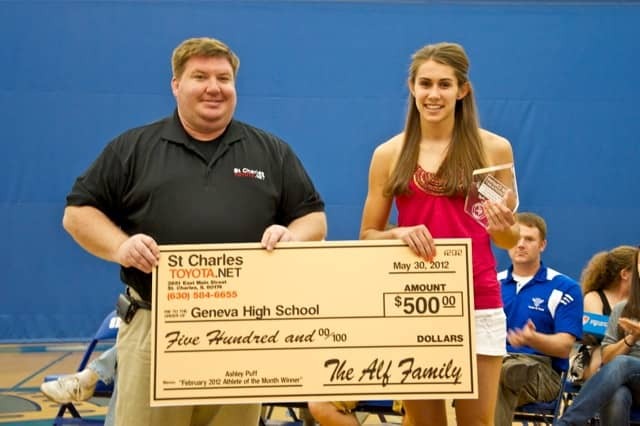 St Charles Toyota is proud to present Athlete of the Month to Geneva High School’s Ashleigh Shain for her outstanding achievements in girls volleyball. Congratulations Ashleigh! 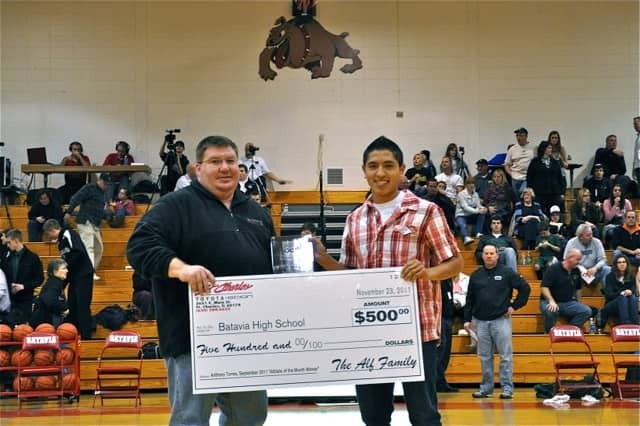 St Charles Toyota Scion is proud to present Athlete of the Month to Batavia High School’s Anthony Torres for his outstanding achievements in soccer. Congratulations Anthony! 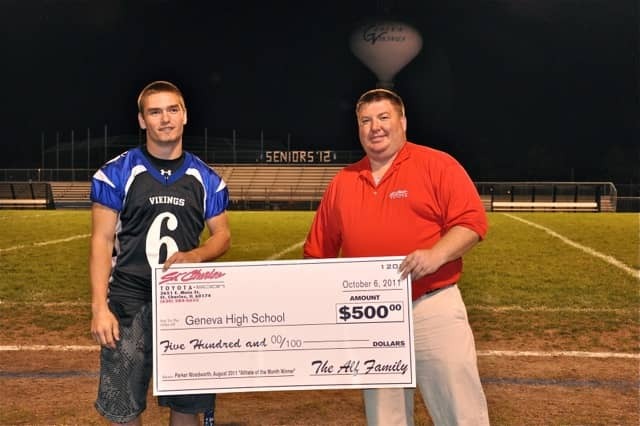 St Charles Toyota Scion is proud to present Athlete of the Month to Geneva High School’s Parker Woodworth for his outstanding achievements in football. Congratulations Parker! 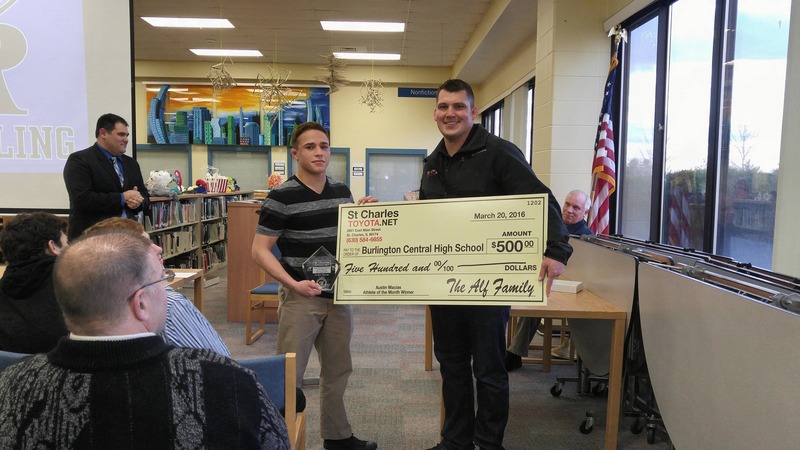 St Charles Toyota Scion is proud to present Athlete of the Month to Geneva High School’s Matt Williams for his outstanding achievements in Baseball. Congratulations Matt! 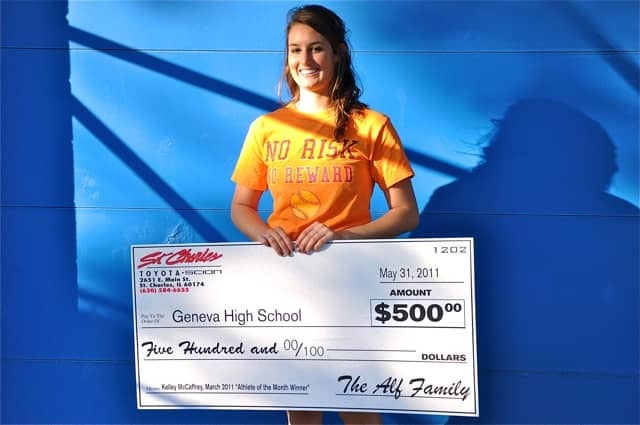 St Charles Toyota Scion is proud to present Athlete of the Month to Geneva High School’s Kelly McCaffrey for her outstanding achievements in softball. Congratulations Kelly! 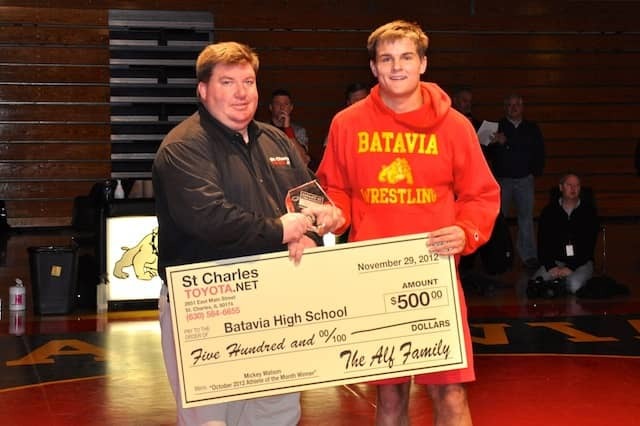 St Charles Toyota Scion is proud to present Athlete of the Month to Batavia High School’s Augie Watson for his outstanding achievements in wrestling. Congratulations Augie! 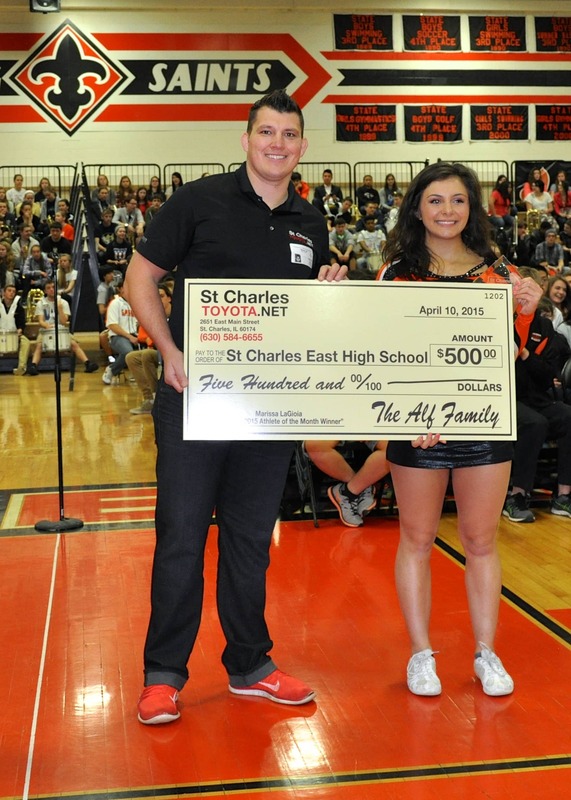 St Charles Toyota, sponsor of High School Player of the Month contest, presented an award May 19 to St. Charles East senior T.J. Travis winner of the April contest. 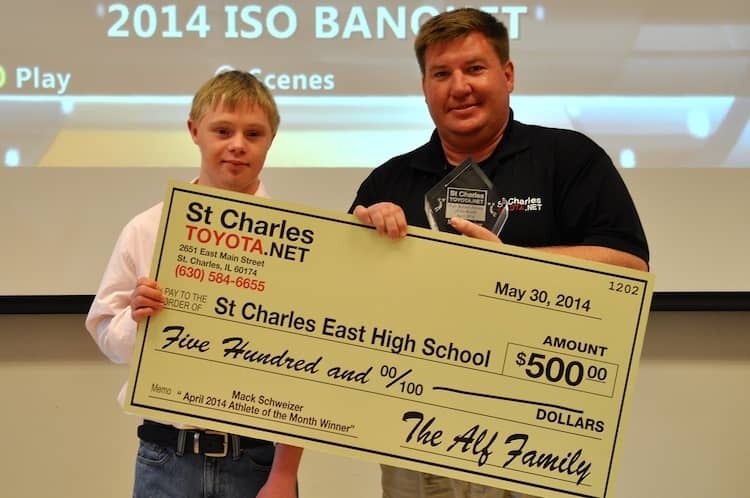 Steve Alf of St Charles Toyota presented the award to Travis, a catcher on the school’s boys baseball team. Varsity baseball coach David Haskins and Kathie and Tim Travis, T.J.’s parents, were on hand for the presentation at the varsity baseball field at St. Charles East High School. 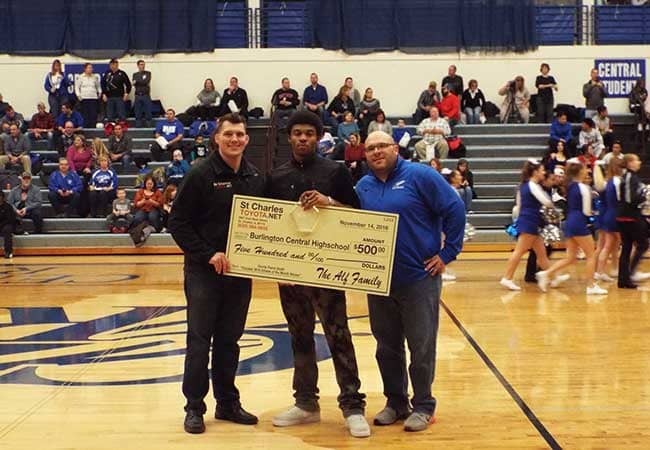 Batavia High School basketball star Ricky Clopton was honored on being St Charles Toyota’s March Athlete of the Month contest winner at a school booster club meeting April 7. 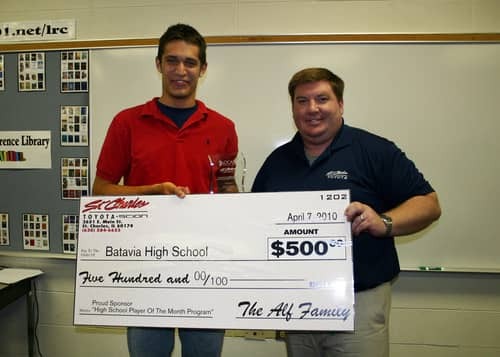 Clopton received a plaque and Batavia High School was awarded a $500 check donated by St Charles Toyota. 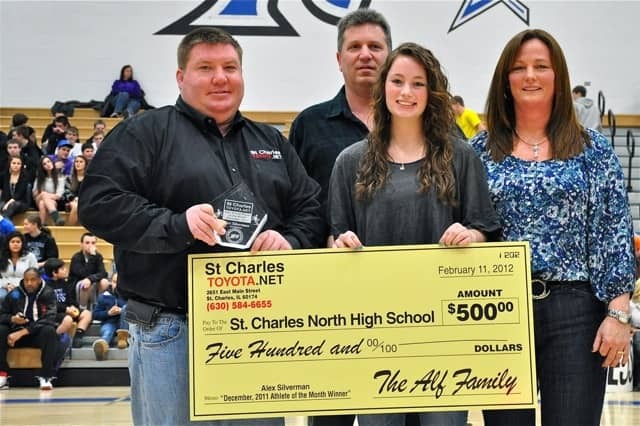 Senior basketball player Lexi Baltes was honored on Friday, February 26th for being St Charles Toyota’s February High School Athlete of Month. 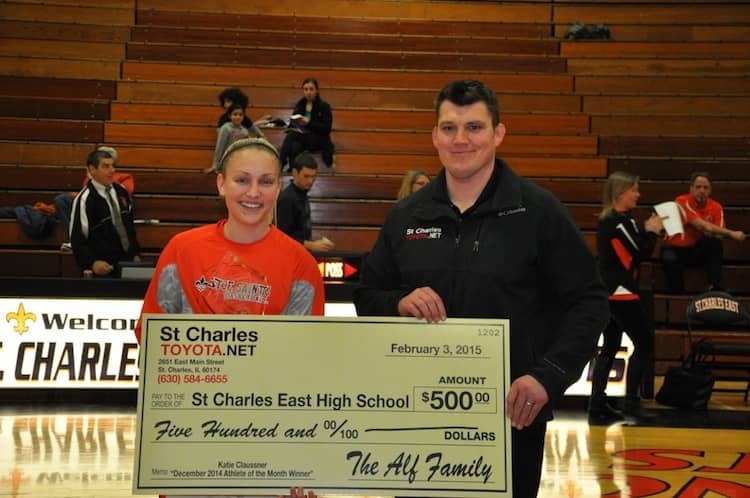 St Charles Toyota, on behalf of Lexi’s accomplishment, donated $500 to St. Charles East High School. 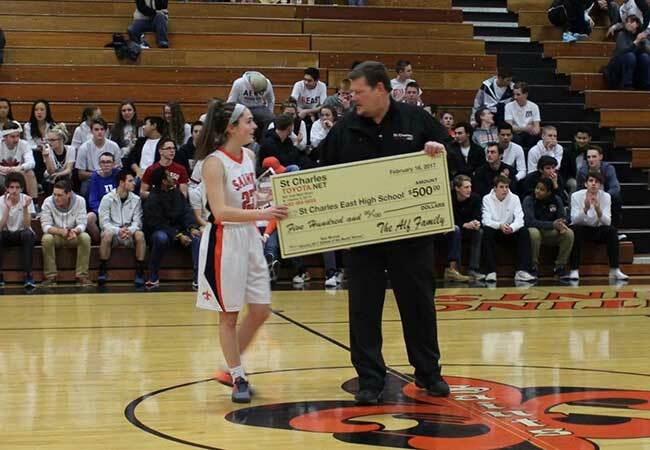 Steven Alf presented the oversized check to Lexi Baltes at half time along with her coach Lori Drumtra. 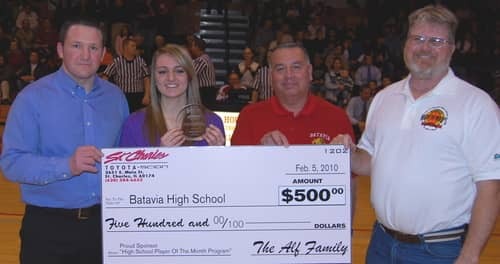 Batavia High School basketball center Kelsey Stone was honored on being St Charles Toyota’s January Sports Athlete of the Month contest winner at a school booster club meeting April 7. 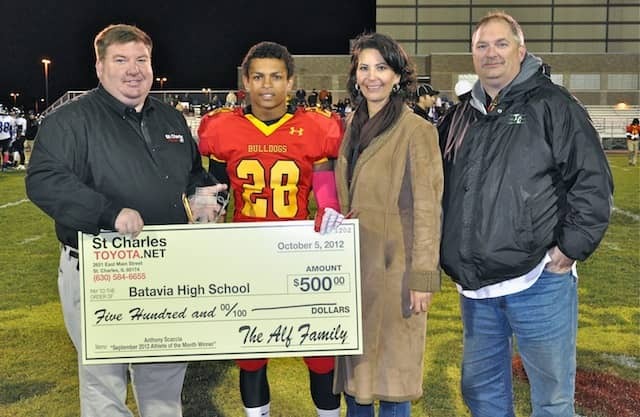 Stone received a plaque and Batavia High School was awarded a $500 check donated by St Charles Toyota. 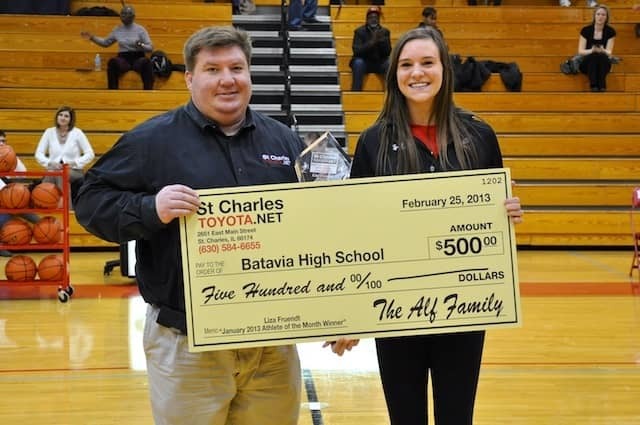 St Charles Toyota honored Batavia High School junior Megan Ramp Feb. 5 as the winner of the High School Athlete of the Month contest for December. 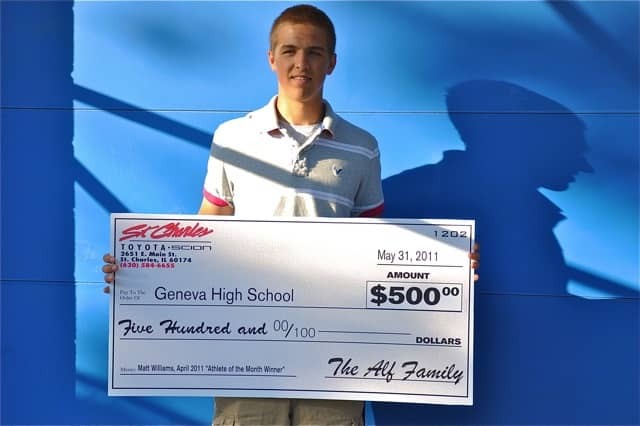 Ramp served as captain of the girls’ golf team and was a key contributor to Batavia’s success during the 2009 season. Ramp was honored during a ceremony before Batavia’s boys basketball team hosted Glenbard South. 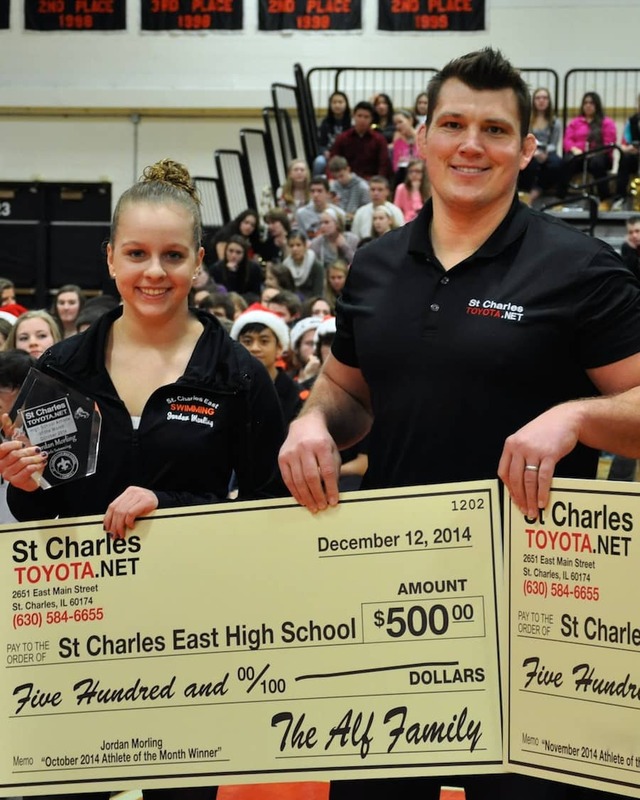 St Charles Toyota makes a $500 donation to the student’s high school and presents the student with an award. 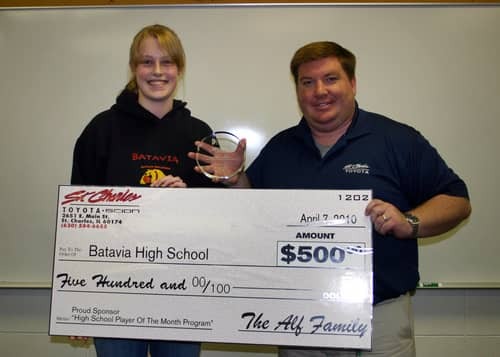 St Charles Toyota awarded the High School Sports Athlete of the Month to Batavia High School Senior Katie Rueffler Nov. 28. 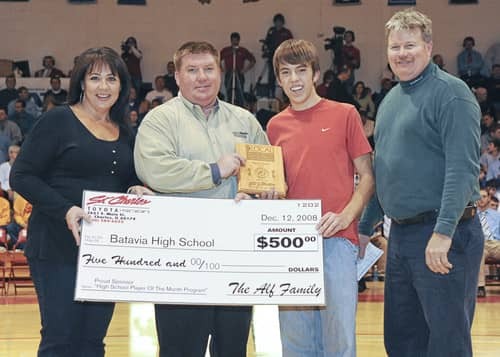 The volleyball player earned the most votes in the monthly poll, and Batavia High School will recieve $500 for its Booster program from St Charles Toyota. Fruendt is a four-year starter for the boys basketball team, and his coach, Jim Roberts, said he shows great leadership skills and a willingness to work to make the everyone around him better. The senior is averaging 20 points and 8 rebounds per game as a guard/forward. 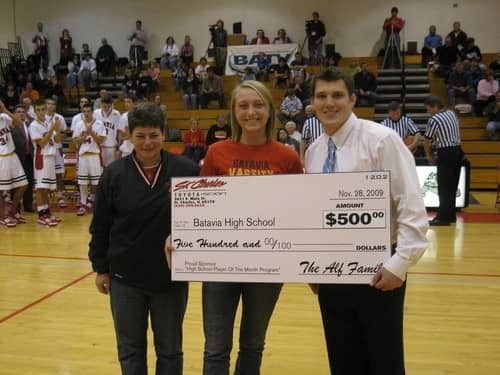 The contest sponsor St Charles Toyota donated $500 to Batavia High School. 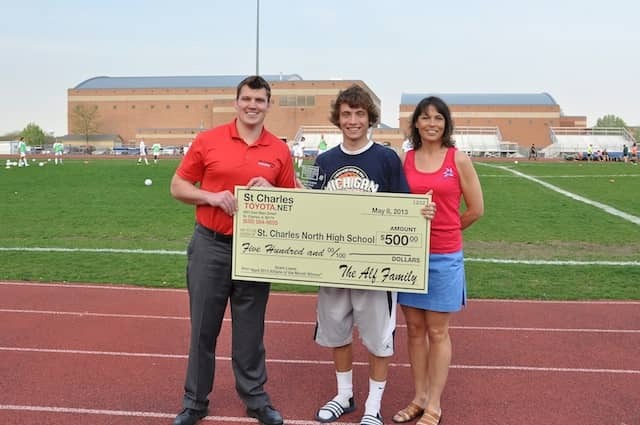 Steve Alf of St Charles Toyota presented St. Charles East High School senior Charlie Lyon with an award Oct. 2 honoring the varsity soccer goalie as High School Athlete of the Month for September. 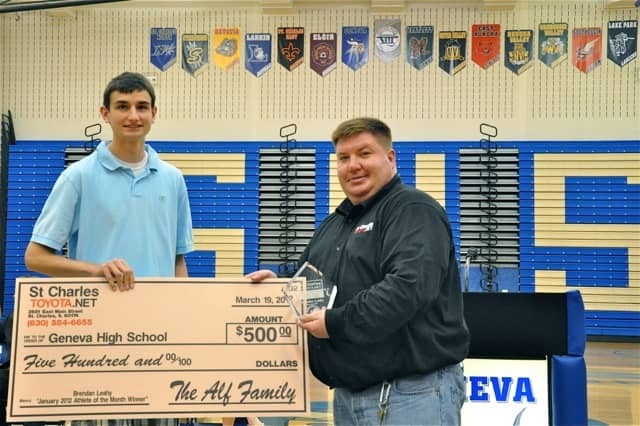 Alf made the presentation during an all-school assembly recognizing the high school’s fall athletes. 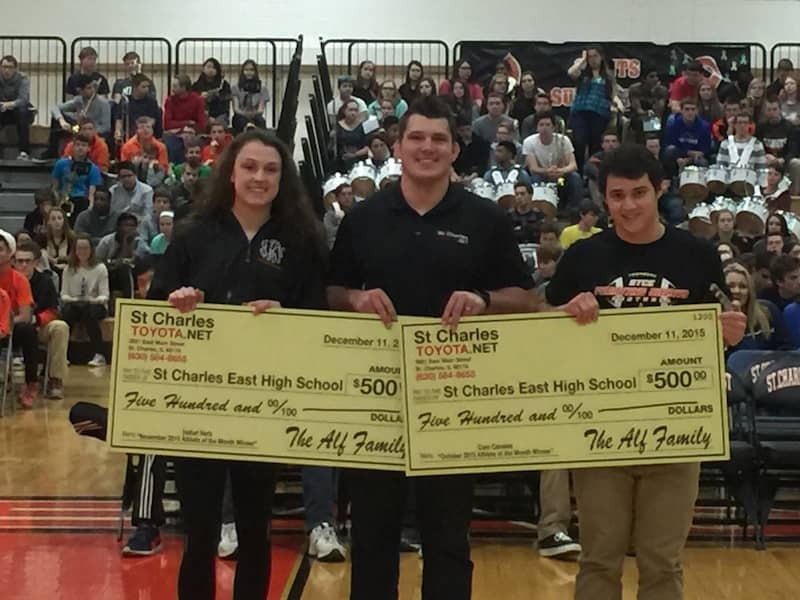 St Charles Toyota, sponsor of the High School Athlete of the Month contest, also made a $500 donation to the school’s athletic department. 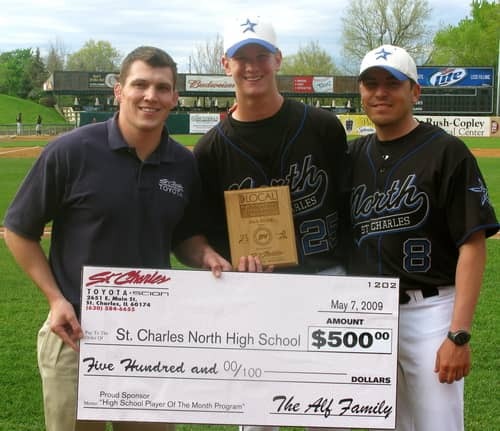 Steven Alf of St Charles Toyota presented the Sports Person of the Month Award for April to St. Charles North pitcher Zach Hirsch during a ceremony May 7 at Elfstrom Stadium in Geneva. 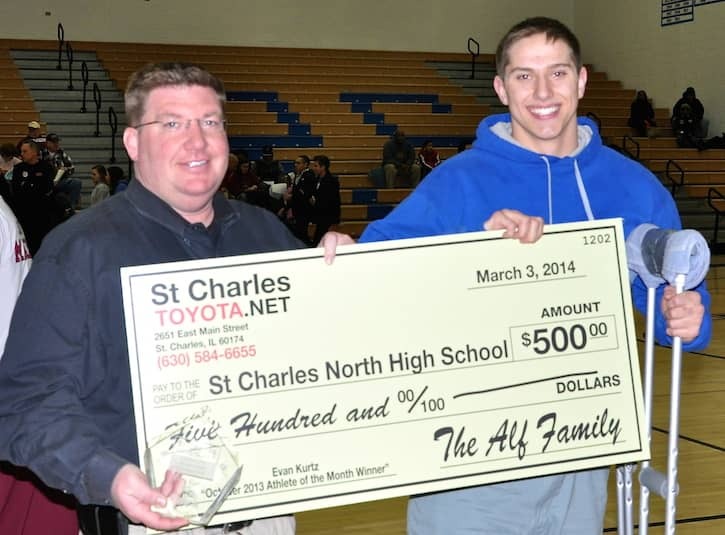 St Charles Toyota is the sponsor of Sports Person of the Month contest and donates $500 to the winning student’s school. 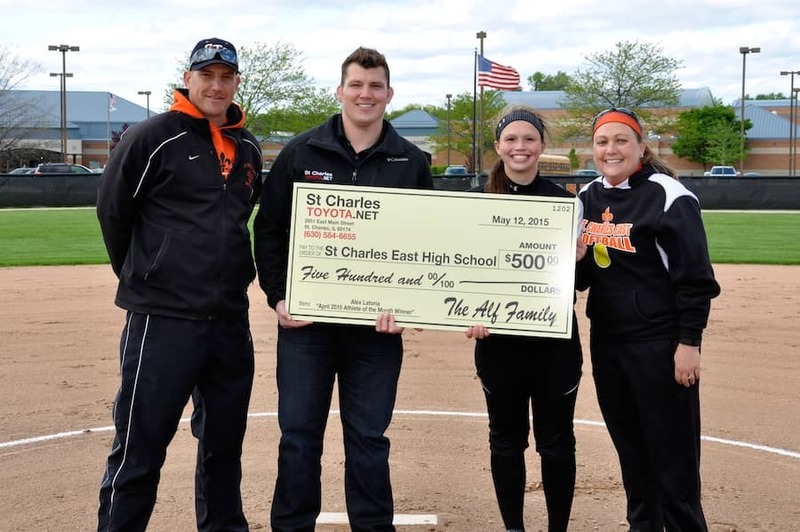 The award and check presentation was part of the final game of the cross-town baseball series between St. Charles East and St. Charles North high schools. The games were played at Elfstrom Stadium, home of the Kane County Cougars. 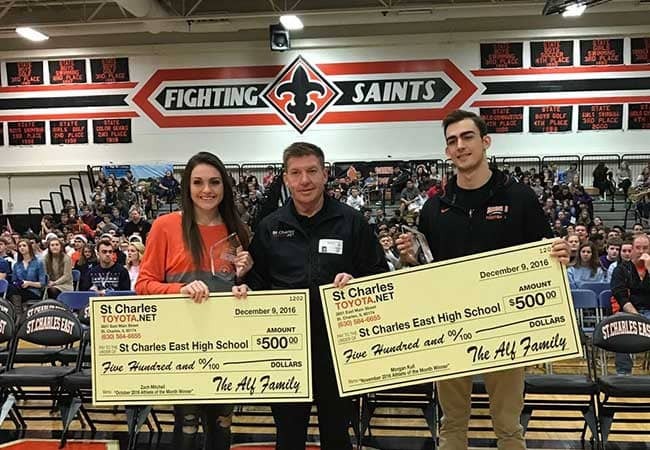 St. Charles East High School celebrated basketball star Natasha Lalos being named Athlete of the Month in March, recognizing her during a school assembly April 17. Lalos was nominated for the contest for her contributions to East’s girls varsity basketball team this year and won the popular voting in the March contest, defeating student-athletes from five other area high schools. 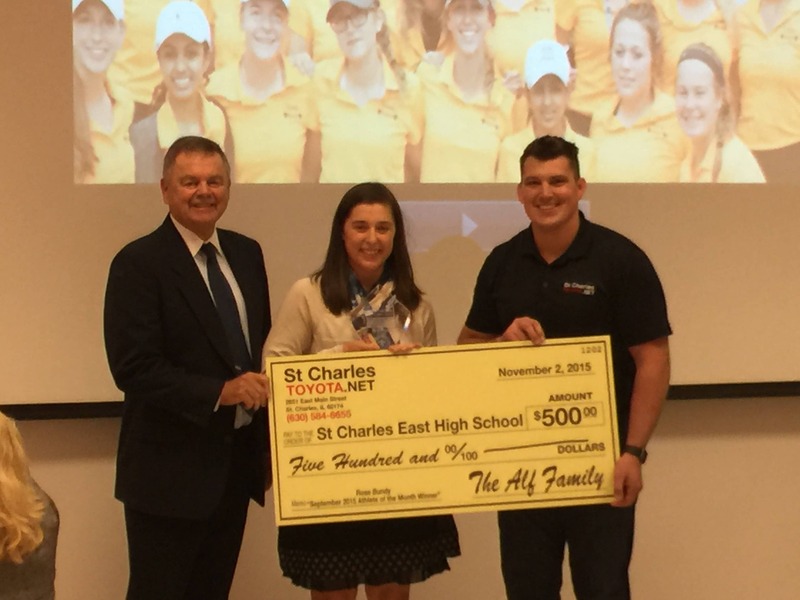 Steven Alf of St Charles Toyota the contest’s sponsor, presented an award to Lalos and presented a $500 check to the high school in honor of Lalos’ victory. The presentation took place during an assembly honoring the athletes participating in the school’s spring sports and other students. 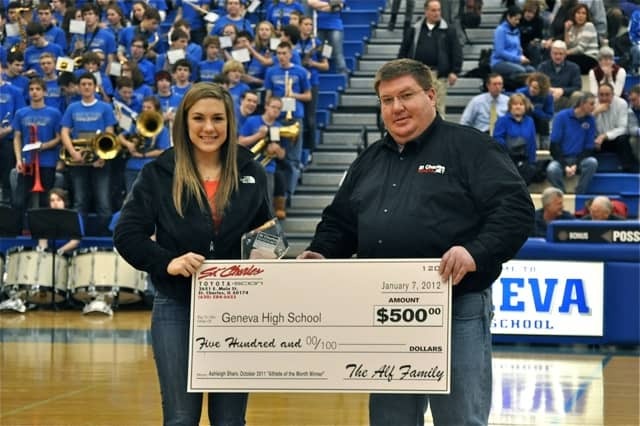 Sports Person of the Month for December Laura Homann was honored Friday night in St. Charles. 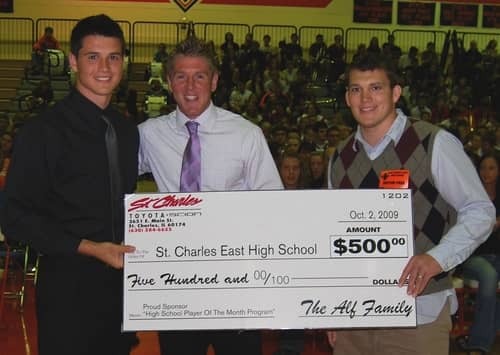 Dennis Alf from St Charles Toyota presented a check for $500 to the school. 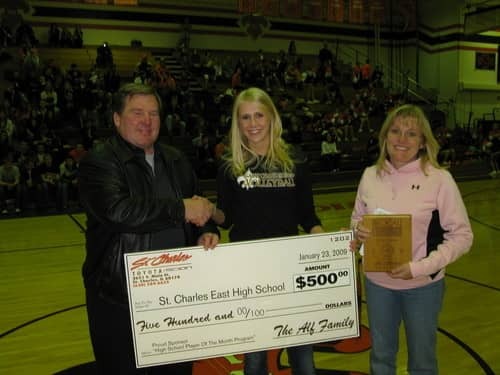 Homann was part of the Saints state Championship volleyball team. club board member were on hand at the presentation. 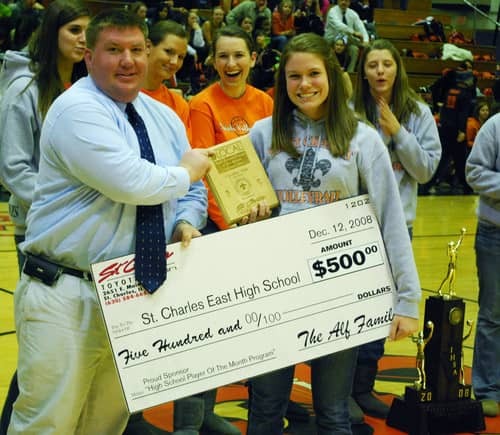 The St. Charles East girls cross country team, which finished third in the state in Class 4A, and the volleyball team, which won the Class 4A volleyball title, were honored during a Dec. 12 girls/boys basketball doubleheader between the Saints and East Aurora. 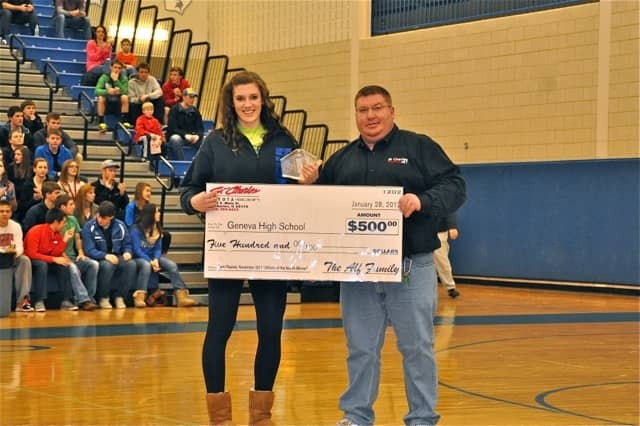 Included in the festivities was a plaque presentation to volleyball star Caroline Niski, who was Athlete of the Month. 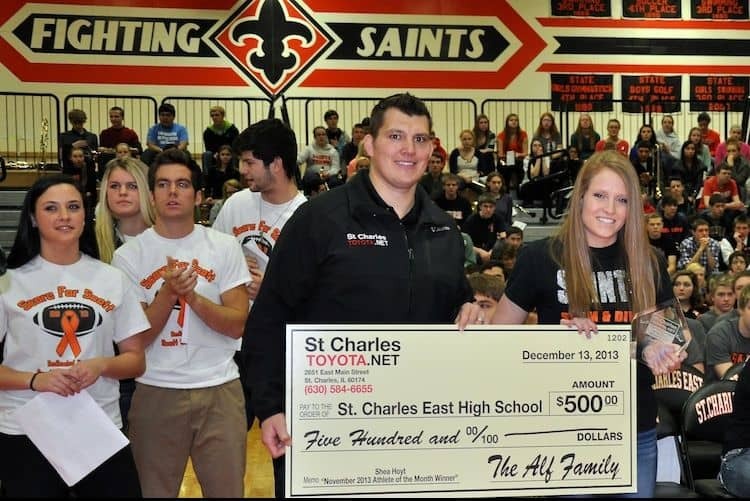 The Saints athletic department received $500 courtesy of St Charles Toyota. Band and was recently named a semifinalist in the 2009 National Merit Scholarship Program. 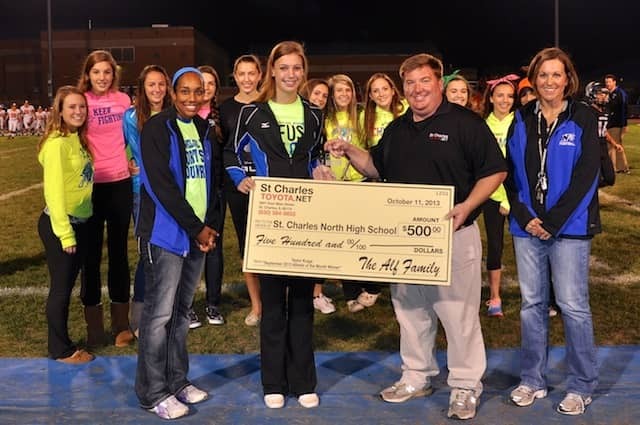 The contest sponsor St Charles Toyota donated $500 to St. Charles North High School.